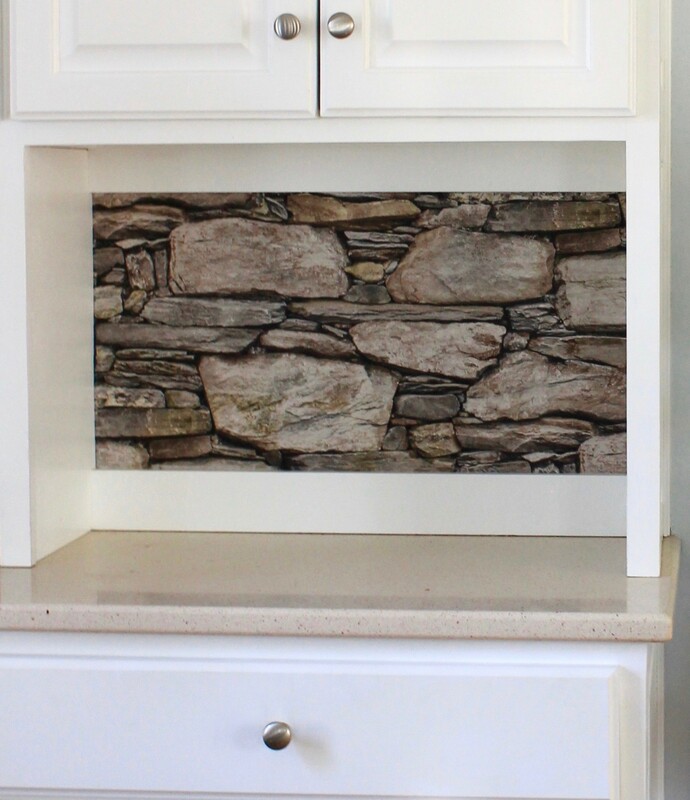 Turn your cluttered kitchen hutch into a stunning work of art. Do you ever have people over for dinner and, after receiving countless compliments on your beautiful handcrafted kitchen table and striking countertops, you reply with the words, “Oh, thank you! Except for that – just ignore the mess over there.” When you point and refer to ‘over there,’ you’re talking about your built-in kitchen hutch, the place that’s become a catchall for mail, newsletters, bank statements, keys, the dog leash, empty grocery bags, your wallet, paper plates, and who knows what else. It’s an embarrassing eye sore, but when it comes to built-in kitchen hutch ideas, well, you have none. I mean, really, who has time for that? Since your schedule is packed with more important things than creating a design from scratch, I’ve done the leg work for you. As an interior decorator, my job is to come up with ways to transform bland spaces into works of art, and I’m always up for the challenge. One of my favorite projects is getting rid of clutter, and then creating a new a space that prompts an organizational project where my clients can put their paperwork in a drawer, filing cabinet, or other place that’s hidden from view. When it comes to these astonishing transformations, built-in kitchen hutches are high on the list. 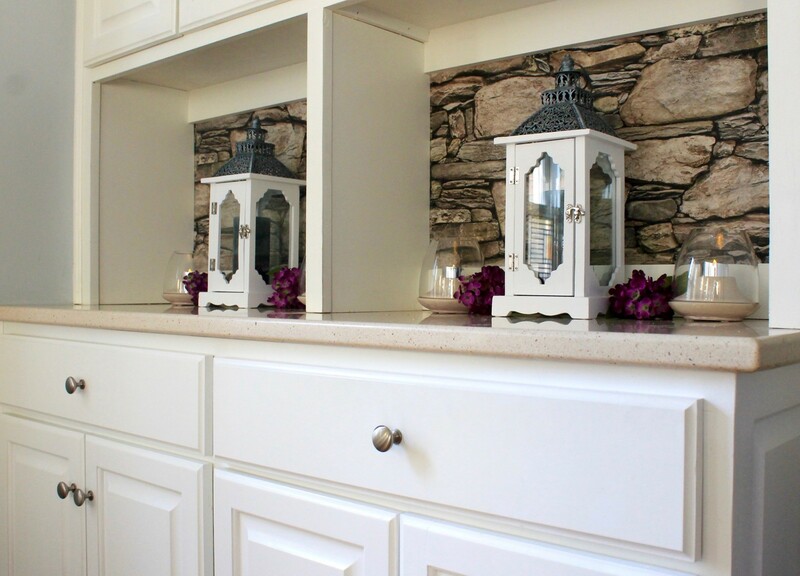 Here’s are three ways that you can transform your built-in hutch from messy to marvelous. The first order of business is to remove everything from the countertops, decide what to keep and what to throw away, then use the built-in hutch storage for the things you’re keeping. Since built-in hutches have cabinets and drawers, this is where you can store your plastic cups, napkins, pens, scissors, paperwork, and yes, your car keys. Once you’ve found a suitable place for these items (avoid the temptation of transferring them to another tabletop or countertop space), it’s time to dress your blank canvas. Since these cabinets, and the alcove that’s sandwiched between them, are all white, I decided to add a three-dimensional look to the walls in the alcove. Instead of solid-colored paint, I wallpapered both alcove walls so that it looked like a stone wall. Now I know what you’re thinking. “There’s no way that you can convince me to embark on the most frustrating decorating project on the planet.” Just hear me out on this one. I found the most spectacular invention that’s been a complete game changer for me: removable wall paper. It’s really easy to learn how to hang removable wallpaper, and is literally fool-proof. There’s no glue, water, or frustration. If you accidentally place it slightly crooked, just peel it off and reapply it. Yes, I’m serious. It’s wondrous. Not only was it incredibly easy to apply, but it looks absolutely stunning. The three-dimensional look of the wallpaper alone creates a striking contrast against the pure white cabinets. As seen in the ‘before’ picture above, this client has extra wall space on the right side of the built-in hutch in the kitchen, and put a stool there, which ended up being a place to put cases of bottled water. In order to eliminate any temptations to put non-decorative items in that space, I placed a tall, slender accent table there with a floral arrangement that brought out the greens and blues in the rest of the kitchen. 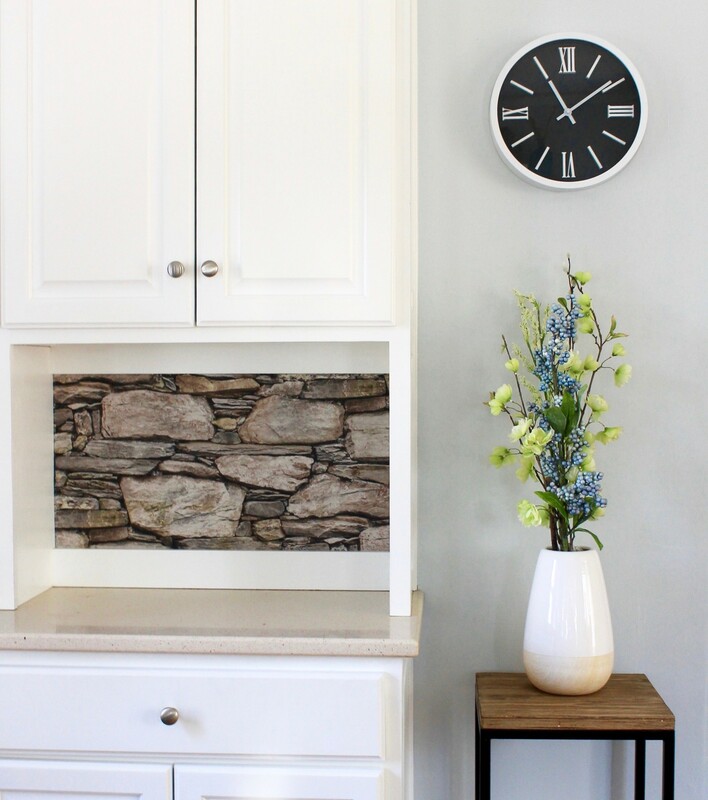 I also replaced the wall clock with a more modern one, which just like the wallpaper, provides a striking contrast against the light walls and cabinets. Keep in mind that you don’t want the surrounding areas to look too cluttered. When decorating a built-in kitchen hutch, it’s important to make sure that the wall art and any other decorative items play a supporting, complementary role. Creating an inviting ambience makes family meals and dinner parties all the more enjoyable, and again, less is more. The whole entire countertop space doesn’t need to be overflowing with décor – just a few simple pieces can go a long way. I chose to use decorative lanterns with pillar candles as the main decorative pieces with tea light candles on each side. 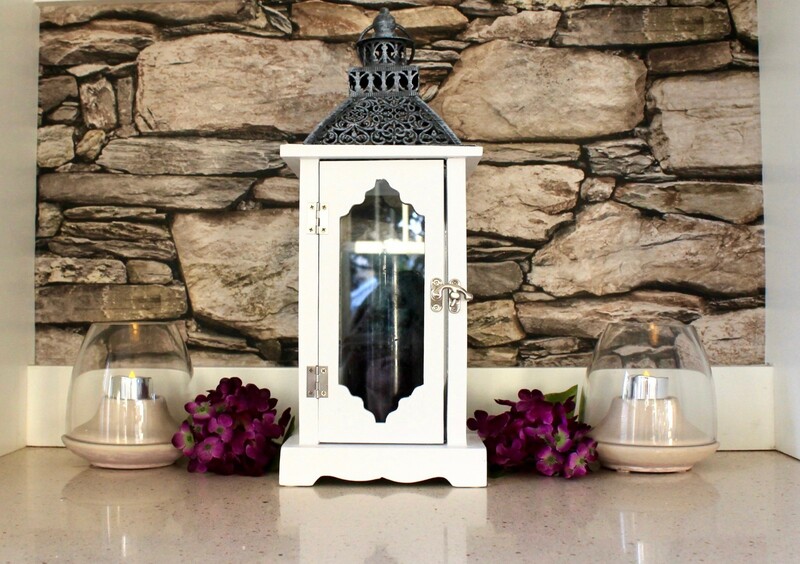 To add more color and visual interest to the space, I placed purple hydrangeas in between the lantern and tea light candles. This design provided a sophisticated look, and truly upped the “wow” factor in regards to the overall transformation. When it comes to updating your built-in kitchen hutch, it really only takes a few simple items to make a big difference. In addition to creating an inviting ambience, this can also be a great way to stage a house for sale since it has a clean, uncluttered look. It’s amazing what a little bit of wallpaper and tasteful décor can do!